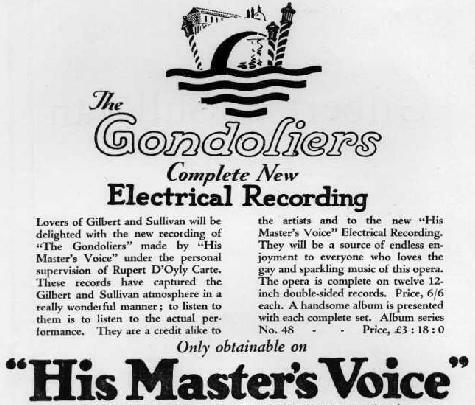 This recording was the second in a series that HMV commenced in 1927 to take advantage of the then-new electrical technology. 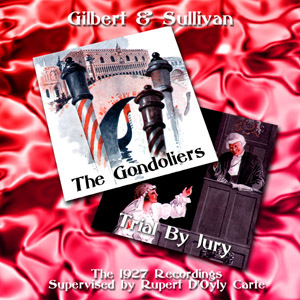 It is one of the most popular G&S recordings ever made, remaining in the catalog for as long as 78's were offered for sale (after all of the other HMV sets had been deleted), and frequently re-issued on both LP and CD. 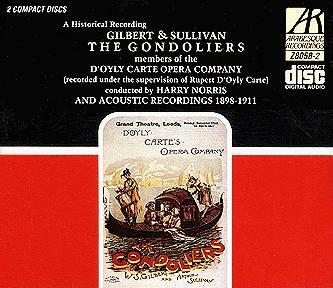 On its musical and dramatic strength, this is the best available recording of the opera, although the 1961 Gondoliers, by virtue of including all the dialogue and being in stereo, offers serious competition. Nonetheless, this is a recording all serious G&S fans should have. This set is recorded on twelve records as against the eleven and a half of the old, with the further advantage that under modern conditions more can be got onto a record. A restoration is made in the early part of the Overture, but I doubt if it comprises the whole of the cut passage. I slightly prefer the older rendering, but allowance must be made for what one is used to when I make a remark of that kind of any of these records. The delightful opening scene, to the general exit "to the altar hurry we," is spread over one more side than in the old set, and several pieces of symphony are restored, much to the listener's satisfaction. It is very well done; Richard Walker has the best chance of the soloists, and takes full advantage of it. On the arrival of the Duke, "and suite," I had a fear that Lytton was not going to be himself, but he has recorded In enterprise of martial kind excellently. The two duets on the other side are beautiful; so they were in the old set, but here we have the recitative restored. Sheffield does equally well with No possible doubt whatever. Is this interchange of the second and third verses official? The quintet, Try we life-long, has always been a favourite of mine; this record did not give me so much pleasure as I expected at the first playing, but won favour at the second and third. Although Tessa is properly cast now, I am not satisfied with When a merry maiden marries. But I very much like Winifred Lawson's Kind sir, you cannot have the heart. The finale is a considerable improvement on the old set. Modern methods enable a less hurried rendering to be made of the opening chorus of Act II. 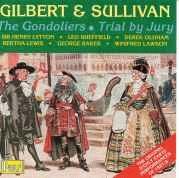 George Baker makes another good record of the song he sang well before, but I cannot help wishing it were an all-Savoyard cast, completed by one of our old friends, Fredrick Hobbs or Sydney Granville. Take a pair of sparkling eyes. One approaches a record of this song in a state of nervous apprehension. This fresh rendering by Derek Oldham is free from blemishes that irritate, and is, I think, the best yet recorded. I cannot say it has all the virtues that an exacting critic demands, but it is pleasing, and I expect I shall like it better as time goes on. In Here we are at the risk of our lives the duet is much better, but the Cacucha, which should really be called a Fandango — I saw the genuine article the other day — is a sad disappointment. The dance music after the chorus is cut, which was not done in the old set, and there are no castanets. Sheffield sings There lived a king splendidly; we must excuse him a few liberties here, as elsewhere. In a contemplative fashion probably cannot be perfectly recorded; this, however, is not bad. On the day when I was wedded is, in my opinion, an improvement on a good rendering, and Small titles and orders a great improvement on a poor one. I am a courtier was well sung before, and now has the advantage of four Savoyards in the quintet, but the gavotte music after the song is taken quicker than before, both here and in the Overture. Personally, I wish it was not. The finale in the old set was scarcely worth playing; now we have Once more, gondolieri restored, and get a much more effective curtain. One expects a great deal from new records now. I am not an unqualified admirer of electrical recording. Instrumental music always sounds to me as if it was being played in the bathroom, and I regret to say some of the women singing in this set have voices of a jarring quality that is only too faithfully reproduced. But I have great pleasure in finishing with a warm expression of appreciation for the orchestra, a body apparently without honour in the factory, where it is casually noticed in brackets, thus "(with orchestral accompaniment)," without any conductor's name. 1980 Arabesque LP 8058-2L Also contains a sampler of early acoustical recordings. An excerpt from side 17 was issued on EMI's A Tribute to George Baker. According to the liner notes of the Pearl LP re-issue, side 6 was also published under the matrix number Cc11366-3 (i.e., take 3 instead of take 2). The table above shows the published takes in the order recorded. Where a session produced both unpublished and published takes for the same selection, the unpublished matrix numbers are shown in italics. Where none of a selection's takes from a given session were published, the entire row is shown in italics, and the side number is blank. Where it is not possible to make a likely guess about the number of takes recorded at a session, this is indicated with "…" Where the published take was achieved without a make-up session being required, the unpublished takes for the same selection are not shown. Sides 8 and 12, recorded on 29 September, were retakes of material first attempted at earlier sessions (7 and 16 September respectively). 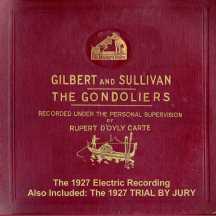 The second and final session for the 1927 Trial by Jury took place on the same day, and it included two of the singers (Hosking, Lawson) that would also have been needed for the Gondoliers retakes.